This Twistable Rosary Bracelet is made from genuine ivory jasper stone on a strong and stretchy cord. This allows you to twist this full sized rosary around your wrist for an instant and stylish bracelet that has personal meaning to those who pray the rosary. 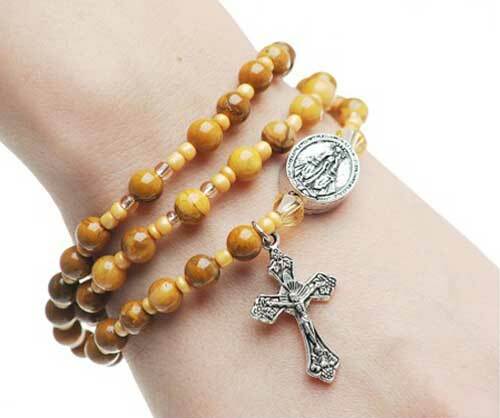 This rosary will fit all sizes of wrists! These semiprecious stones have beautiful color from creamy ivory to shades of brown. The natural beauty of thse stones are polished to a sheen. The rosary has tan, glass seed bead spacers with an accent color around each Our Father bead. The Miraculous Medal is slightly thick to allow for the stretchy cord and has a bicone cut crystal bead on each side. This style rosary bracelet allows you to have a full rosary easily available without undoing a clasp. A wonderful, thoughtful gift. Available in 10 various semiprecious stone colors.